A new set of four different fluorescent boron-rich hybrids based on an octasilsesquioxane core (T8) are presented herein. The syntheses have been carried out starting from styrene-containing ortho- and meta-carboranes and an adequately substituted octasilsesquixane derivative (p-BrStyrenylOS) via Heck coupling reaction. 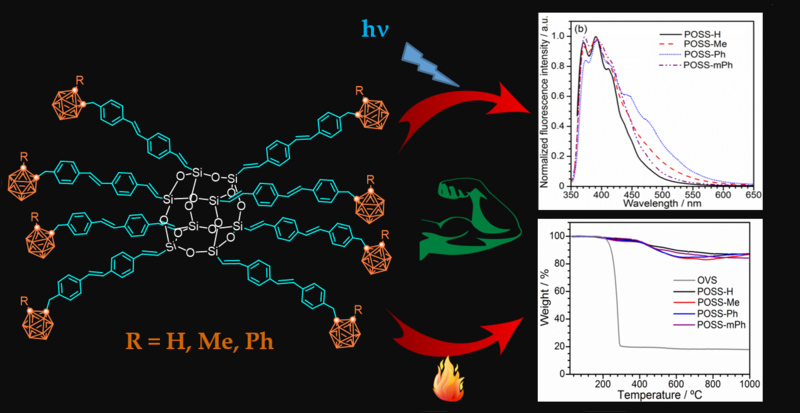 The carborane clusters are attached to the T8 core through para-substituted stilbene spacers, which act as the main electronic donor of the molecule and as a result are responsible for the photoluminescence properties of the hybrids. These have been assessed in DCM solution, concluding that the presence of the carborane clusters plays a key role in the increase of the fluorescence emission displayed by the hybrids. A comparative study of different substituents (H, Me or Ph) linked to the adjacent carbon atom of the ortho-cluster revealed that the unsubstituted o-carborane derivative (POSS-H) has a much higher quantum yield in solution (ΦF = 59%) than its two counterparts. Besides, a comparison between two hybrids containing phenyl-substituted ortho- (POSS-Ph) and meta-carborane (POSS-mPh), demonstrated a significantly higher emission enhancement by the latter, backing the results we have previously reported for similar systems. In the solid state, the emission is largely quenched in all cases (ΦF = 4 to 7%) as well as bathochromically shifted due to considerable intermolecular interactions. Finally, the thermal resistances of these hybrids were tested by TGA under an inert atmosphere, unveiling weight losses as low as 15.8% and proving that the attachment of the carborane moieties to the T8 core outstandingly improves the thermal stability of the final POSS.